Since it’s a new year, I thought it would be appropriate to do a Throwback post. …Remember last year? It was a week ago. But I’m not going to be talking about last year. 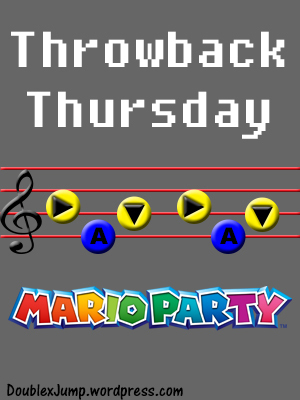 I’m going to talk about one of my favorite game series, Mario Party. I recently got Mario Party Star Rush and I’ve already played through the entire game in just under 10 hours. For a video game, that’s not a long time. While I felt the game was better than Mario Party 10 (there will be a review for Star Rush at a later date), I definitely missed the replay value of the other Mario Party games. It wasn’t so much the gameplay that bothered me this time around. It was the replay value. I could play Mario Party 1 through 8 over and over again for the rest of my life and never get bored. And I could highlight all of the games, but I won’t. I’ll just stick to the original and the latest (good) one. Mario Party 1 was released in the US for the Nintendo 64 in February 1999. While there wasn’t a large character roster, there are 8 boards to play on (two of those boards you have to buy with in-game coins and unlock). Each board has its own level of difficulty as well as certain quirks and features of the board making each one a totally different experience to play from the other boards in the game. And the mini-games? Awesome. No matter what Mario Party game I play, I will always just sit down and play through the mini-games without bothering to play in party mode. Its latest successor, in my opinion, would be Mario Party 8. I never played Mario Party 9 and you know my thoughts on Mario Party 10. Mario Party 8 was released in the US for the Nintendo Wii in May 2007. This game was a big deal because it was the first Mario Party game with the new motion controls of the Wii. And, while some people found the controls and some of the games annoying, I didn’t mind it. I personally liked the motion controls… As long as it worked properly, of course. Compared to Mario Party 1, there were more playable characters in Mario Party 8. However, there were only 6 boards to play on and they were pretty simple. Each one had it’s own characteristics, as usual, but some of them were too easy. The mini-games were cool with the motion controls. There were definitely some games I loved more than others, but it was overall pretty cool. With that being said, the old school Mario Party games were definitely better and more fun than the ones that are being released today. And, of course, we all know that everyone’s favorite is Mario Party 2. Which Mario Party is your favorite? Do you remember playing the older games? Let me know in the comments below! Ooh nice post about Mario Party! My first one is my favorite, except the games where you have to spin the control stick kind of ruin the game (and players’ hands!). I also liked Mario Party 2 and 3 for adding costumes and duel minigames. And I would also agree that Mario Party 8 is solid. I like that they changed up the formula for some boards, particularly the Monopoly board (Koopa’s Tycoon Town). The GameCube ones are okay, but they were all too similar, especially for a yearly release schedule. Mario Party 9 is okay and introduced the car where everyone moves together on the board. I liked it at first, but now I just want a return to old-school Mario Party. I was disappointed when Mario Party 10 continued the car mechanic. I might have to try the 3DS version sometime though, even though it’s a portable Mario Party. Nice post about the Mario Party series! I’ve never played through the GameCube versions but I prefer the original three Mario Party games because each one built on top of of each other and the mini games were so much fun. I did enjoy playing Mario Party 8 though and I did appreciate the effort they made to change up some of the board gameplay. Like Mr. Panda, I liked the car mechanic at first at the initial release of Mario Party 9 but would like a return to the old Mario party games where you collect stars instead of the mini-stars. One thing I’ve never understood for Mario Party is why is there no way to play with players globally? The original games were definitely the better ones. I never played Mario Party 9, but I was open to the car idea when Mario Party 10 came out. The game was too short though and the mini-games were limited so I didn’t like that. That’s a good point. We should be able to get online to challenge other people. That would be so much fun! I have played mario party 10 at gaming conventions and i liked the bowser party idea! But yes agreed the game was far too short. Im shocked that for a game thats built around playing with other people that online multiplayer hasn’t been enforced yet. Maybe we might get a mario party game on the switch that might have online functionality. The Bowser party was cool, but he was definitely over-powered. If you weren’t Bowser, it brought the difficulty and stress levels up, which was nice, but once Bowser hit you, that was it. If Mario Party comes to the Switch, I’m sure we will because that’s kind of the point of the Switch, to take it around with you. But if that’s the case, it better be like an old-school Mario Party game, lol. Yea thats a good point, he was really over-powered. Well we can all hope that the mario party series goes back to its roots if it comes to the switch.